Orana Wildlife Park is home to New Zealand’s only gorillas! Our troop consists of three males – Fataki (a 190kg silverback), Fuzu and their half-brother, Mahali. 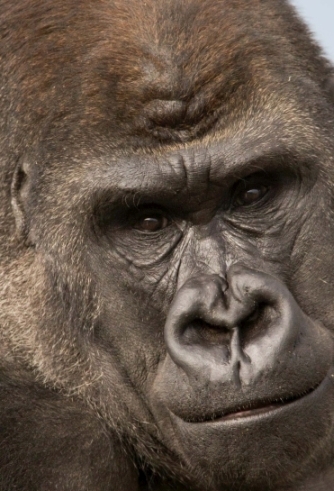 The gorillas are simply magnificent and are one of the world’s most impressive primates. Please check with our staff for gorilla viewing times on the day of your visit (best viewing is typically in the morning). The gorillas are housed in Orana’s $6M Great Ape Centre - the most ambitious project ever undertaken by the Park. Construction commenced on 7 July 2014 and was completed on 15 June 2015. The gorillas arrived mid-June (2015) and the Centre was officially opened by Hon. Lianne Dalziel Mayor of Christchurch on 30 July 2015. The Great Ape Centre was placed on hold for two years due to the Canterbury earthquakes. The original plan was to create a Gorilla Habitat, however the construction delays resulted in a revision of the concept. Through extensive expert consultation the finished habitat enables Orana to hold two species of critically endangered great apes (in separate habitats within the one complex). Sumatran orang-utans will be transferred to Orana during 2017. Orana is proud to have joined the international zoo-based breeding programme for Western Lowland Gorillas, a critically endangered species. Our initial role is supporting the programme by holding bachelors and raising awareness on the plight of gorillas. In the future Orana Wildlife Park may receive a breeding recommendation. Threats to gorillas are primarily driven by lifestyle choices such as habitat loss due to coltan mining for electronic devices. Orana Wildlife Park has partnered with Re:Mobile, a New Zealand firm that recycles and re-markets mobile phones, reducing the demand for new handsets and associated environmental impacts. You can help by placing any old mobile phone in our collection box when visiting. As a charitable trust, Orana raises 100% of funds for each new development and generating the required funds for the Great Ape Centre was a champion effort by our team. We gratefully acknowledge the grant organisations, estates, individuals and companies who generously provided funding for the project and thank the contractors who went above and beyond for this key development. We especially acknowledge Ian Cumberpatch Architects and Strongline South Ltd who were the lead contractor and project manager respectively for the development. Read/ watch media coverage of the grand opening! Our aim, along with being dedicated to the conservation of endangered species and the welfare of our animals, is to provide education, recreation and enjoyment to the public. Copyright © 2014 Orana Wildlife Park. All rights reserved.